Lessons You'll Look Forward To! 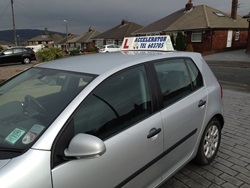 Your driving lessons will be relaxed, enjoyable and fun but at the same time stimulating and challenging. You won't be treated like some immature know-nothing idiot, having orders barked at you like you're in some sort of military boot camp, there are plenty of other driving instructors who'll treat you like that if that's what you want! With Accelerator School of Motoring each lesson will be structured around what you want and need to achieve. You'll end your driving lesson looking forward to the next one! By treating you as an individual and matching modern training methods to the way you learn best you'll find you need less driving lessons to pass, and you'll become a better driver beyond your driving test too. This will save you money, and may one day save your life! i recommended him to my team mates!" Very friendly,great instructor,good car to drive,passed my test first time,absolutley brilliant. Thank you so much.I would recommend you to anyone. Call 07710430700 or 01254603705 now for details of how we can help you to pass your test and become truly independent! Dual controlled, air conditioned car for your comfort and safety. We go further and puts you first - call now on 07710430700 or 01254603705 for our latest offers and start on the road to success.